From afar the Blood Raiders watched the death of their little hunters. The Sisters of EVE ship they had been ordered to trail had sealed its fate at the largest drone hive Antar had ever seen. It was an amazing sight. The Sisters ship, which had lain still for a while, moved in and was immediately targeted by the drones. A few of the monstrous machines approached it, and apparently engaged in some kind of dialogue. The Raiders didn't catch any transmissions, but since the drones hadn't started murdering anyone, Antar reasoned they must be busy keeping up the conversation. Not long after, the drones started moving again, closing in on the Sisters ship like a trapped prey and literally tearing it to pieces. The last that Antar's team saw of the ship before the drones completely enveloped it was a glimpse of its starboard side, which looked like a hunk of twisted metal. Part of Antar's team had laughed and whooped - you didn't last long as a Blood Raider if you couldn't take joy in terror - but it was nervous laughter, tempered by worry of what would happen to them. Someone asked Antar whether they would be going the same way, and he grabbed the chance to instill calm in the crew. "Hell if we are. Get me HQ," he said, with ridiculous bravado. "Someone wanted us here and they can damn well explain what this is all about." It took the communications crewmember a lot longer than usual to get a response from the Raider base. For a moment Antar wondered whether he, too, had been led here as some kind of prey. He had to admit to himself that it would not be a disappointment. He had played the pious worshiper and the exuberant hedonist, and in some of his long nights he had wondered what would happen once he had filled in all the gaps of his soul. Better to be sacrificed while it meant something, even if only to his enemies, than to be extinguished for no reason at all. The crewman waved at him, snapping him out of his reverie. "HQ, are you there?" Antar said. A voice said, "Hold, please." Antar raised an eyebrow at the crewman, who shrugged and raised his hands, palms up. Shortly after, another voice sounded out from the speakers. It was a crackly, raspy little thing and gave Antar the chills. "Greetings, Raiders! You have no idea how lucky you are." The captain recognized the voice, but couldn't recall where from. "Can you state your credentials, please?" he said, in an even tone that he kept devoid of any challenge. "Certainly, captain. My name is Omir Sarakusa. A long time ago an Amarrian group of heretics struck out for fortune and glory under the title of Sani Sabik. I am a leader of one of their branches, a group called the Blood Raiders. You may have heard of us." Antar's stomach turned to ice. Every face on the bridge turned to look at him. "Sir, this is an honor. It truly is." "That's nice, Captain," the voice said, and Antar could swear there was something in it that felt utterly inhuman, "But right now I'd like to hear your tactical assessment of the situation." "Sir, we're looking at a hive of rogue drones - quite a monstrosity, actually - and mere moments ago we saw them tear apart the Sisters vessel that we'd been instructed to follow. Whatever its captain was after, he took the wrong path there." "That's a shame, Captain. I was just about to ask you to go the same route." Antar truly did not know whether there was humor or seriousness in Sarakusa's tone. He tried not to think of the fact that madness, which was very much a theme of the Blood Raider life, often combined the two. "What are your thoughts, Captain?" "That I had better get my affairs in order, sir," Antar risked. "Do you have any other course of action to propose?" "Well, sir," Antar said, "My crew and I are Blood Raiders to the core and I can't honestly say that we fear death. But given the choice, I'd prefer that it not be meaningless. I presume I was told to come here for a reason, and I also presume there's something on the other side of those mad machines that's worth retrieving." "This is true, Captain. Go on." "We have never spoken before, sir, but from the barely concealed amusement in your voice I suspect that you know what's out there and how to get it. But for what it's worth, my course of action, if we are to get past these murderous drones at all, is to call in an armada of Blood Raiders and anyone else who'll support us, and bring the fire to those metal beasts." "That's not a bad plan, Captain. Given your current intel, I expect it's the only one that makes sense." "That would be an accurate summation. Sir." "Here is why it wouldn't work. The thing that lies on the other side of these drones, a machine that the Sisters were after, is much valued and highly desired by almost every power in Empire and beyond. Merely amassing a fleet would attract far too much attention before we're ready. A burst attack on the drone facility would do the same, but we'd never get that far, because as soon as everyone saw what was on the other side they would tear through their own people to get there first." "Sir, what is on the other side?" "Jamyl Sarum's superweapon, son. The end of the world." The Captain stood there, speechless. "We have friends, Captain, who have greatly facilitated us in this process. They have spies within the Sisters' ranks - in fact, they have even clashed with the Sisters on past hunts for strange relics, though none so magnificent as this one - and they were perfectly happy with letting the Sisters show us the way to the weapon. I will put you in direct contact with them quite shortly. You are to obey their instructions to the letter. If you do so, I have reason to believe that this quest of yours will end with you manning the greatest destructive weapon known to mankind. Do you understand what that means, Captain?" Antar saw it, in his mind's eye. The weapon, surrounded by an armada of his people, making its way into Empire space like poison into a vein. Hovering over other ships, space stations, cities on planets, and laying waste to everything in sight. Millions of people, billions, wiped out with unstoppable force. It would be the greatest harvest the sect had ever seen. The grandest slaughter in the entirety of human history. They would lay waste to the life before them. It would be the culmination of the Blood Raiders' existence; the achievement of all their goals. The end of the road. "I understand, sir," he said, and he did, beyond all measure. "I detect some doubt in your voice, Captain, even over this great distance. Do you have any compunction about the incredible harvest that this weapon will grant us?" He did. "None whatsoever, sir." He did not mind the carnage in the slightest. It was something else preying on his mind entirely, but now was not the place. "Then you know how important it is that everything go according to plan. Again, obey our friends' instructions and you will get out of this not only in one piece, but a hero of the Sani Sabik." Shortly after, they were hailed again. A new voice spoke, one that was unknown to the captain. It felt emotionless and dead. It said, "Are you listening?" The voice said, "We will upload to your ship an extensive packet of data. Once you have accepted its delivery you will fully verify its integrity, for any errors will kill you and cost us the entire mission. This data bulk is an access key that will alter the drones' programming, resetting it to its original state, and thus grant you safe passage. We entrust you with this because we cannot be seen in this area, but we will expect recompense. Once you have secured the weapon, you will bring it to a named location for us to inspect. We are interested in the theory of the thing, not its use." And in reproducing it, I'm sure, Antar thought, but said nothing. The voice continued, "Once we have finished our inspection, the weapon will be free for your faction to use in whatever way you wish. You may use the drones as necessary to resupply you with fuel. You should understand that any attempt to violate the terms of this agreement, such as by failing to bring the ship in time to the assigned location, will have disastrous consequences for you and your faction." "You're going to booby-trap it, aren't you?" Antar said, less as a question than a resigned statement. "Of course," the voice said, less as an answer than an obvious statement of fact. "It will already be rigged in some fashion, but the drones will take care of that. Instead of disabling the traps, they will render control to us. We get the weapon, or no one does." "How can we trust that you will not betray us?" Antar said. This, too, was not a question, but he felt it needed to be said, if only so his crew would know he had thought this far. "You can't, obviously," the voice said. "But you can very much trust us to explode the vessel if you fail. Prepare for acceptance of the data string. And bring the ship to the wrecked station by planet ten, moon two in the Roua system." The transmission ended. Someone in his crew said, "That's a ... Society of Conscious Thought area, sir." The captain closed his eyes. "So it is," he said. He heard the navigator say, "Data transmitting, sir," and nodded his acceptance. Shortly after the ship moved forward, toward the massive hive. The drones immediately targeted and engaged. The ship transmitted its data, and for a quiet moment Antar thought with perverse relief that they were still doomed to die. 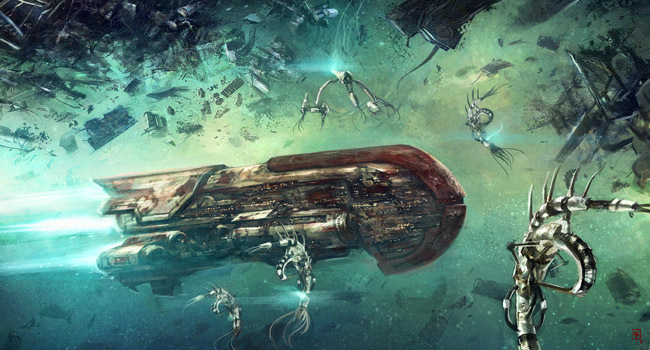 His thoughts changed to puzzled amazement when the nearest drones suddenly disengaged, stopped dead in their tracks and started orbiting the ship as if they were protecting it. He had the navigator pull up a wide picture of the drone hive, and the sight was amazing. It was as if a wave of cognitive dissonance was sweeping over the poor machines. The ones that had been heading towards the ship went every which way, some back to the hive, others towards the blue star in the distance, and a fair few in directions that seemed utterly random. Others, mainly the drones that had been carrying isogen-5 to the hive, apparently sped up their efforts, zooming back and forth with such fervor that a fair few missed the hangar entrance and crashed into the hive walls. A handful of drones even flew into one another and began to fight, only to break up again a moment later and head their separate ways. Antar saw how most of the drones - the ones not holding isogen-5, at least - kept opening and closing their claws, as if grasping at empty air. Against his communicator's advice he attempted to hail them, but there was no response. He suspected the drones were not incapable of communication, but merely too busy dealing with their new programming to answer at all. He felt he could sense their personalities, bubbling through the chaos. They seemed very puzzled at the change and not at all pleased with it. A new conscience, ages in the making, might now have suddenly been yanked back to start, like a dog who'd only just learned to roam before the leash was put on with a vengeance. He noticed how even some of the isogen-5 transport drones, who had apparently continued with their tasks unabated, would stop every now and then, as if trying to shake off the effects, before returning to their fixed routines. As his ship approached the Abaddon, other thoughts of boiling panic and despair began floating to the top of his mind. This was the culmination of his life's work, the final filling in the gap that would supposedly make him whole, and while he had no compunction about the reign of terror he was about to unleash, he was beginning to fear and loathe every minute of it.